Are you ready for an adventure? 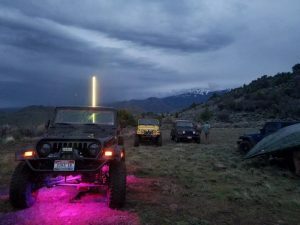 The Idaho Off-Road 4X4 Club is hosting it’s 6th annual Chuck Coble Memorial run on Saturday, April 27th, 2019. 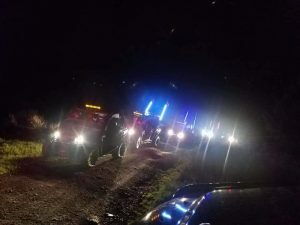 The Rocket Run is a nighttime off-road event where participants search for illuminated checkpoints in the Owyhee Desert. Idaho Off-Road Club is an association of people brought together to share a single passion: Four Wheeling! They are a family-oriented club dedicated to keeping our public lands open while practicing the policy of TREAD LIGHTLY! So, what exactly is the Rocket Run? You start the evening with an amazing dinner with all the trimmings, prepared by The Basque Market, before you roam around lost in the desert. Of course, before you head out, you will have the opportunity to win some awesome raffle prizes! This fun run through the desert is also a poker run with prizes. Once you check in at each of the three manned light towers, you will be given the GPS coordinates to bonus check points. If you make it to the bonus check point, you get an additional playing card to make the best poker hand. After dinner, a rocket will be launched off in the distance. Every 30 minutes a visual hint will be provided to help you head in the right direction. A CB or ham radio with a tuned antenna. So, if you think you are up for the adventure, click the link here and get signed up! No Jeep? No problem! Peterson in Nampa can help you out with that. We have a huge selection of Jeeps that can help start your adventure! 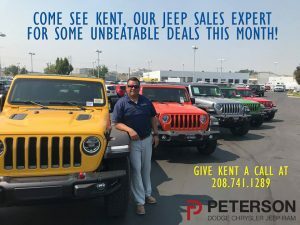 Give us a call at 208) 475-3000, and ask for Kent Shurtleff (Jeep Squad), or just stop by 5801 E Gate Blvd at Garrity in Nampa.